Cass Centre for Charity Effectiveness has partnered with the DM Trust to launch a series of five annual lectures to mark the outstanding contribution to marketing by Derek Holder, the founder of the Institute of Direct Marketing. The lectures are open to all and are free to attend. The first lecture in the series was presented by Dr Carol Homden CBE, Chief Executive of Coram, with a response provided by Stephen Lee, Senior Teaching Fellow in Voluntary Sector Management, Cass Business School. The talk looked at how innovation in the 21st century marketing practice can transform the lives of charity beneficiaries and the experience of funders and supporters to our causes. Creative Data exists to provide practical learning opportunities for young talent interested in a career in the data and marketing industry. The 2018 programme consists of 3 x 3 day academies and 6 x 1 day laboratories to offer over 250 individuals the opportunity to explore the role data plays in marketing as well as developing key skills and connections that will prepare them for their first role in industry. The DM Trust provided bursary funding for 90 individuals to cover attendance costs. The Midlands came calling in Birmingham for the first academy with 30 engaged students, motivating talks/workshops and a fantastic networking event. Read about Ellie Mees’ experience of untangling 99 articles of densely worded GDPR rules here. The Academy then took place all over again in London and the next Creative Data is in Edinburgh from 26-28 June. The Marketing Academy Foundation is an offshoot of The Marketing Academy and, now a separate, registered charity, exists to provide career starts in the marketing industries for young adults from disadvantaged backgrounds. One way this is achieved is by offering year-long paid apprenticeships, including studying for nationally recognised qualifications. The apprentices are further supported by three mentors who are Scholars at The Marketing Academy and invitations to training events run by their Alumni. The charity has formed a four-way partnership with The Direct Marketing Trust, The Royal Mail and industry to fund paid apprenticeships in direct and digital marketing. There is currently a skills shortage in traditional direct marketing, so training in this as well as digital will provide future-proof skills that are currently much in demand. The DM Trust’s Derek Holder Legacy Fund offered funding of £21k, and it is hoped that five apprenticeships can be funded with matched funding from TMAF and the hosting companies. Each apprentice will work for a full year at a brand owner or agency and take the IDM Certificate in Direct and Digital Marketing, gifted by The Royal Mail. So far, Virgin Atlantic, The Marketing Society and The Prince’s Trust have committed to hosting and co-funding an apprentice and the vacancies are being advertised. The Marketing Academy Foundation is also working on a new initiative, partnering with Atomic to scale its Canvey not Cannes programme. They will visit five schools in tough areas to do a careers talk and offer at least two paid internships to those pupils this summer. This will help overcome another barrier to entry for individuals from challenging backgrounds, who do not have the contacts or the means to work in the unpaid internships that are a common access point for others. ReynoldsBusbyLee Ltd and KMB Ltd were granted funding from the DM Trust to create and run a series of practical hands-on workshops for trainers within organisations who are responsible for ensuring that their customer facing teams are conscious of and sensitive to the needs of customers who may be in vulnerable circumstances. The first workshop in September 2016 sold out quickly and four more took place in 2017. These sessions provided a practical training session of trainers to learn how best to train these training materials (available for free from the DMA UK’s website) for contact centres handling contacts with vulnerable customers. The workshops also considered how to adapt these materials to suit each organisation considering the training needs of different departments within the business and also different customer groups. Four further workshops with updated and new materials will be held in 2018. The funding from the DM Trust enabled them to get this essential initiative off the ground and allowed delegates to attend the workshops at a heavily discounted rate. Further funding has allowed for four workshops in 2018. The workshops are led by DMA vulnerable taskforce members Elaine Lee of Reynolds Busby Lee and Jacqui Crawley of KMB Ltd, and the workshops sought to train managers of contact centre teams with a high level of interaction with the public, and therefore vulnerable consumers. The sessions taught techniques to help recognise consumers in vulnerable circumstances; instructions on how to adapt conversations and interactions to suit the acute needs of the consumer; and a guide to using the DMA’s training materials. These training materials – entitled ‘TRUST – Recognising vulnerability and making reasonable adjustments’ – were crafted by Reynolds Busby Lee Ltd and KMB Ltd with additional materials created by the DMA’s taskforce as a package of advice, guidance and expert-led best practice for marketers to dip into and apply to their work, straight-away. Feedback from the training session was overwhelmingly positive and highlighted the appetite within the marketing industry for guidance around vulnerable consumers. Attendees included Amnesty International, Great Ormond Street Hospital, Save The Children and the WWF-UK, Capita, Which?, Gladstone Brookes, BT, Royal Air Force Association, Direct Line Group, Confero, Capital One and Money Management. The taskforce also released a whitepaper entitled ‘The vulnerable consumer’, defining vulnerability and packed with best practice advice for brands. In the spring of 2017, the DM Trust granted the Young Women’s Trust £6,000 to help develop their marketing and communicating skills to enable them to support more disadvantaged young women across the UK. The grant was used to fund a one day bespoke copy writing training course for their staff. The staff who attended were predominantly from the fundraising and marketing team, as well as two trainees who were young women from the charities beneficiary group. Young Women’s Trust is a relatively new charity, only five years old, dedicated to supporting young women (16-30 years old) who are unemployed or living on low pay. They are a small charity, trying to tackle an urgent and pressing problem. Resources for training are limited which is why the grant from the DM Trust was so invaluable. It enabled their staff to consider in detail the way in which they communicate about the young women they support and the impact the charity has. The training also developed their ability to market the charity to the general public and to raise more funds. Increase the response rate to their current direct marketing mailings: they achieved an average response rate of 6.6% from their last appeal which was above their target. This included a 56% response rate from their regular givers and a 15% response rate from people who had not given recently. Increase in legacy pledges: last year they raised over £90,000 from legacies, donations made in people’s wills, which was a significant increase from the previous year. Increase in the number of regular givers who donate £50 per month or more: they recruited 24 new supporters who now donate £50 per month, which is a significant uplift in the value of regular donations they receive. Overall they raised 7% more income last year and supported three times as many disadvantaged young women into work and out of poverty. The IDM Summer School 2016 took place earlier this year and gave students a week-long insight to the marketing industry. 30 specially selected candidates were invited to join them to learn about what it’s really like to work in the marketing business. During the week, students worked on a live client brief set by The Economist. They also visited global marketing agency, RAPP and got to spend the day at London digital agency, Greenlight Digital. On top of this, the students also got to attend an exclusive networking evening with senior marketing professionals. 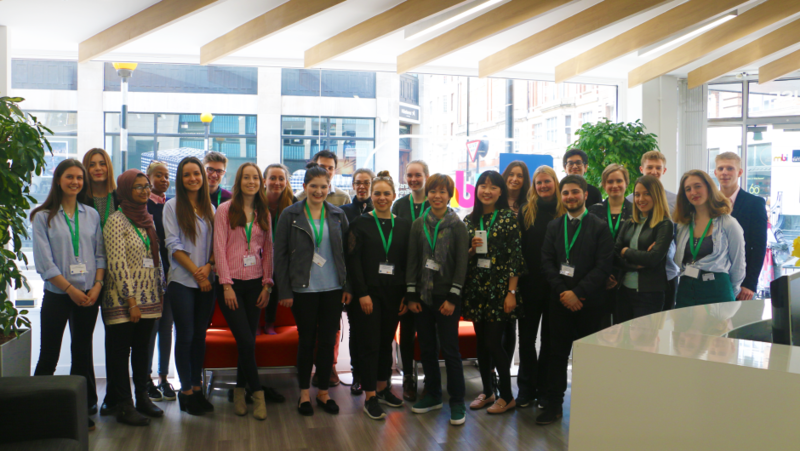 Since graduating from the programme, students have gone on to work at some of the biggest names in marketing including RAPP, Ogilvy, Merkle Periscopix, Greenlight Digital and Havas Helia. Commercial Break works with young people from diverse backgrounds to give them a start in the marketing and advertising industry. The Direct Marketing Trust funded two two-day IDM training courses for those working on the programme. The DM Trust funded IDM courses in May and August 2016 for half a dozen young people. The aims of the project matched some of the aims of the DM Trust, namely to introduce talented young people into the profession who would not normally enter it. In the August intake seven young people were chosen to work on a new brief set by EE. They worked on the brief under the supervision of Commercial Break’s co-founders James Hillhouse and Susie Burdekin, using their creative thinking and skills. Funding of £5,400 covered a two-day interactive training course covering digital marketing essentials which includes both activities and lectures. Just before the Easter break, 30 students were invited to experience The IDM Creative Data Academy. The programme focused on inspiring young talent to pursue a career in data within the marketing industry. The students were selected from over 250 applications from universities all over the UK from disciplines such as economics, history, psychology and maths. The course was free with no attached costs so there were no economic barriers and we were delighted to welcome a student with only 10% vision and his guide dog. The IDM hosted a selection of exciting speakers from companies including Data IQ, Direct Recruitment, The Economist, Aquila Insight, RAPP, Model Citizens and REaD Group. Industry experts shared their knowledge and provided insight into what graduate career paths are available in data. Students were set a brief by The Economist which focused on how the publication could boost their female readership, the winning team are to be rewarded with an exclusive invitation to lunch with senior executives and a digital subscription to the newspaper. The students visited RAPP and were shown what agency life is all about. Agency staff shared a number of client case studies with the group to show how data plays an important role in the development of a brands business strategy. This was followed a networking reception at the Economist in Canary Wharf opened by DMT’s Melanie Howard. A mix of marketing professionals and big names in data were on hand to answer key questions from the students about working in data. Prior to attending Creative Data Academy, most of the students were unfamiliar with the amount of job roles available within data. Since taking part in the programme, students now have a clear idea of what career paths are available and the type of skills needed in order to enter a career in data. A communications plan has been put in place to stay in touch with the students giving IDM and DMA member content and access to their event programme. The programme will track the career choices of the individuals involved to measure the long term success of the programme. Creative Data Academy in Tweets. A week-long programme for 30 final year students to inspire students to work in the industry. This achieved participation from industry with 5 businesses taking part in the week and providing employment for students. In 2015 the programme received 160 applications 56 universities, 75 students were assessed to award free places for the 30 students. The week covers training, accommodation, food and events. Almost 250 applications for this years summer school were received which ran in June. 30 participants were selected to learn about marketing career opportunities, work on a brief with an agency and speak to employers and other young marketers. Assessment days for the summer school took place during April 2016. Funding contributes to the accommodation, travel and training and enables the Summer School to put on an event enabling the participants to network with and seek advice from employers and publically recognise their achievements in front of industry figures. DMT provided £5,000 to fund the delivery of a two day training course for a small charity covering the essentials of digital marketing in an interactive programme which includes both doing and listening. The training will cover the major digital marketing channels plus an introduction to analytic, branding , user experience and content development. Commercial Break is a small charity which works with young people from disadvantaged backgrounds to give them a start in the communications industry. In November and December 2015 Commerical Break selected 6 young people to work on a brief provided by Comic Relief. They formed a ‘pop-up agency’ and were mentored by industry professionals to complete the project over an 8-10 in January 2016. The training has been scheduled for the last week in April to help students in their placement. A full report will be provided when the training has been completed.